An invite to play with tofu was too good to pass up. Today’s food for fun post is a collaboration with three other fun-loving bloggers. Shanna, of Curls and Carrots, pulled me into a “cooking through the alphabet” game she plays with Sofia over at Papaya Pieces and Amanda of What’s Cooking. I’ve jumped in at T, which was assigned to Tofu. Showcasing a soyfood works as I’ve been Minnesota Soybean’s spokesperson of sorts for nearly 20 years. Soyfoods have appeared here at food for fun, with mentions of Minnesota Soybean’s Real Story blog, presentations I’ve done, and soy recipes I’ve tried just for fun. Timing couldn’t be better, as my oldest daughter has asked to give vegetarianism a try and I want to give her a taste of dinner options beyond cheese pizza. Though she’s not a particularly adventuresome eater, I wondered if tofu lasagna might be a win with her. 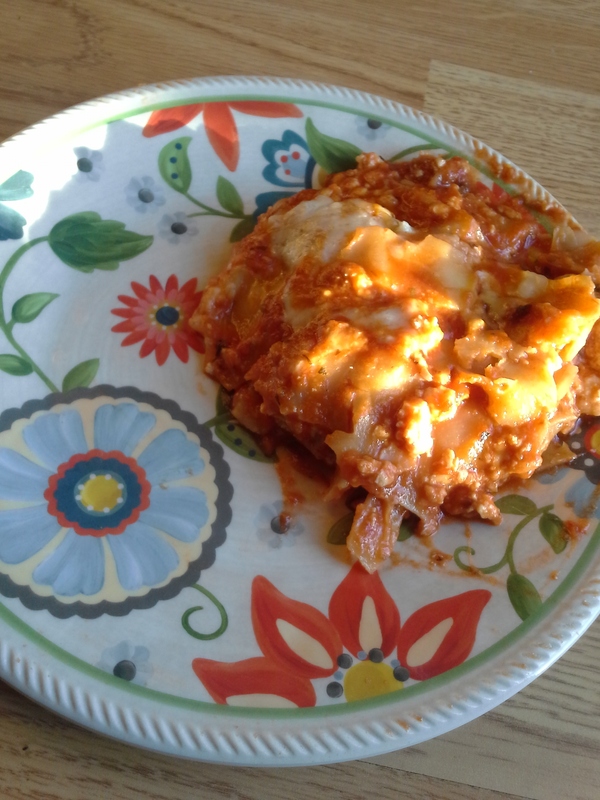 Shanna’s invitation and wanting to feed my daughter a vegetarian meal converged into one task: find a simple yet amazing tofu lasagna recipe. Simple was key as, like most folks, there’s limited time for dinner prep on weeknights. Turning to my bookshelf, I found lasagna recipes with crazy-long ingredient lists and even one that required béchamel sauce, neither of which were happening on my watch. This recipe had to be as simple as noodles, tofu, tomato sauce, and cheese. Tofu in the American Kitchen, a slim volume picked up on a food editor tour of the Illinois Center for Soyfoods, had what I needed. While following the general process, I did a fair amount of pinching and dashing when it came to ingredient quantities and order of layering. It made for a lovely lasagna–cheesy, saucy, warm, comforting. Better yet: the tofu passed easily for ricotta cheese. Told only it was lasagna, my daughter eagerly downed her first bites, declaring it the best lasagna she’d ever had. Knowing me as she does, though, she reassessed and looked me squarely in the eye. Cover bottom of 13×9-inch pan with portion of sauce. Top with layer of noodles and another layer of sauce. Sprinkle with tofu, then mozzarella. Continue layering noodles, sauce, tofu, and mozzarella, ending with cheese. Rinse sauce jars with water; pour mixture around outside edge of pan. Cover with foil; bake 1 hour or until noodles are tender. Uncover; bake 15 minutes longer to allow some sauce to evaporate. Let stand 10 minutes before cutting and serving. Sprinkle with Parmesan. Makes 8 servings. This looks delicious! I love collaborations! Thank you, Laura 🙂 Definitely three cheers for blogging friends! So glad you came by. Liz–that looks fantastic! While it may be a few days before my taste buds, etc. make a comeback, I’m loving the virtual smell from here! Yay, Tracy is here! Sorry to hear the taste buds are languishing. Appreciate your kind words very much. Have written a formal rebuttal to the excess estrogen in men theory for Minnesota Soybean, so I highly doubt that had anything to do with anything, but I certainly don’t know everything. Fertility is a strange thing. Took my husband and I years to conceive and for us it came down to acupuncture (for me) and also abstaining from exercise (again, me). But some folks can run marathons and still get pregnant. ??? Who knows indeed. Sounds like you cured yours and I know we did ours. Agreed about the health pendulum. Crazy stuff. Everything in moderation for sure. Except for then we’ve negated moderation because now we’ve applied it to everything. So how about moderation in some things and then the things you really like (old yearbooks, for a totally random example) you can go nuts over. And I think my daughter is going to nail it for meat-free as it’s just the weeks of Lent. She’s already turned down bacon! She is strong like bull. Am grateful you took me on board so easily 😉 Love how we each had a completely different approach–we pretty much wrote a mini-tofu cookbook! Great story about the greens passing as olives. Strange taste buds that prefer pureed “olives” to greens. Fantastic. Love that you added tofu to the lasagna, it really looks delicious and I can understand why the daughter would request for her birthday dinner. I love tofu, it’s chameleon like quality will take on other flavors so beautifully, proof of that is in your Italian lasagna. Thank you, Shanna. Your words are always so supportive and kind. Glad you enjoyed Clare’s take on the lasagna. Hard to trick kids at the dinner table. Your ground meat sounds fantastic. Do you freeze the tofu first? Thanks, Beth. Can’t fool an 11-year- at the dinner table. At least not mine. From one working mom to another, I say “thank you” for stopping by 🙂 I’ve always come to tofu from an American perspective. How can we turn it into something folks recognize and aren’t leery of? Tell me more about the tofu dish you made. ?? Bet it was fantastico! You’re the soybean goddess of Minnesota?! How cool is that? Congrats on pleasing 11-year-old taste buds! Thank you, KC! lol, I’m no goddess of anything, I assure you. So glad you’re here. I was veg for a few years in my early 20s and now refer to those as the “lost years.” Crazy that you were as well. Ah, the lentil loaf. Thankfully my mom never went there. My daughter wanted to give up meat for Lent, which is odd as we are Lutherans and have never practiced giving things up in the name of religion. Last year she jokingly gave up swearing and smoking. Not sure whether to be proud of her or no, haha. I’ve always wanted to make a tofu lasagna, but the Italian purist in me always says no! This looks delicious, though!! Fusion cooking, Tip Top. It wouldn’t have sold well in an authentic Italian bistro, but it worked well as a weeknight meal 😉 Thanks for coming over! What a creative recipe! Despite my “Italian passport” I would like to taste it… I’m sure is delicious! Liz, that looks really great, and I’m not a major tofu fan. Don’t hate it, but don’t think to use it (probably because I am not vegetarian? Duh!). I am impressed by your daughter’s interest in exploring it as a choice – even if it doesn’t turn out to be a long term choice. I took on the vegetarian ways for 5 years back in my twenties. It was bacon and cheeseburgers that did me in in the end. She turned down bacon? Super impressed. Oh, and, I love the dialogue between you two! Always something good here at Food for Fun! Thanks, Bonnie! And your son’s nickname name is bacon because EVERYONE LOVES BACON? How heartwarming is that? Awwww…. Laughing because now you know a Cake (well, you don’t really I guess) and a bacon. Am proud of my daughter for sticking this out–trying to offer sound veg meals as the first couple of nights I cooked like I usually do (pork chops, steak, chicken noodle soup were three meals), then realized it would be more fair if we all ate a vegetarian meal. Tofu stir-fry tonight! Do you remember feeling healthier as a vegetarian? I lost a good chunk of weight, though in the process of trying to get pregnant I gained it back. Hi Liz – I’m sorry I’m so late to the conversation – it’s been a little crazy over here. That said, I’m SO excited that I can combine one of my husband’s favorite entrees, with tofu. I have to admit that he requires that it be hidden, for he cringes at the thought of food that’s too healthy 🙂 . Seriously, I think he’s convinced that if it’s too good for you, it can’t be good for the palate..Thanks! You’re not late, Mimi. I was early! Posted when the other ladies put theirs our, so it was a daytime thing this week. Curious if you’ll get this one past your husband. Mine always like to comment, “this is good, but it could use ground beef” whenever I make a vegetarian meal. Meat-and-potatoes mentality instilled in him too early to change. My reason for eating healthy food is usually just to leave room for the not-so-healthy stuff. You, too? Welcome to the alphabet game! I do so enjoy the themed posts. Glad your daughter enjoyed the tofu lasagna. Sometimes kids are easy to trick, other times not so much. Luckily I haven’t had much need for tricking my boys, they usually eat everything pretty well. Thanks, Mama 🙂 Have noticed that your boys are more open-minded than my girls when it comes to food. Figure it’ll click eventually. All I can do is provide an example, right? Have been told to prepare for U, so wondering where they’ll go with that. ??? Stay tuned! Loving that other folks are now thinking tofu and lasagna in the same recipe 🙂 Mashed tofu can stand in nicely for ground meat in chili, spaghetti, etc. Especially when it’s been frozen first as that makes it more “spongey” and able to absorb flavors better. I’ve never thought of adding tofu to lasagna, but I could see how it could work. Great that your daughter went for it- very sneaky of you! 😉 Sometimes you just have to omit the truth. When we first met and my husband announced that he hated avocados, I made him a “vanilla milkshake” (with avocado, milk, and honey) then broke the news after he had devoured every last drop. he he he… Anyhow, your daughter will need to get the protein somewhere. Lucky for her that you happen to be a soybean expert! Will say that the tofu stir-fry I served up last night was not a hit with my daughter. I just love when I get a chance to cook with tofu. It’s very rare that I do but I really need to just add it into more dishes along the way. That lasagna looks awesome!! I’m amazed by all the types of cookbooks you have in your collection! Never had tofu lasagna before, but this really does look tasty! It’s always nice when a simple recipe turns out delicious. I must try making this sometime for my vegetarian FMIL 😀 Thanks for sharing, Liz! Ha, thanks Ada. We’re in the process of moving bookshelves around and while it’s wonderful to have boatloads of books (cookbook and otherwise), they’re a pain to shuffle. I do like my collection, though. Try to weed out as I go forward, but always end up buying more as well. yes, the tofu post 🙂 Glad the marinara went down well. Was surprised at how many people hadn’t seen tofu used in lasagna before. Some folks won’t touch Asian soups, stir-fries, etc and subbing it in for ground meat in classic comfort food dishes is a good way to introduce soy. Am sure there are good tofu cheesecake recipes out there, but I’d rather go for the full-fat cream cheese version. Why mess with perfection, right? Stay tuned for U. Seems plans are already being laid… Thanks, Saucy! This looks fantastic! I have been quite lazy about trying tofu, I often pick it up then put it back not really knowing what to do with it, looks like I know what to do now! Thanks, Jayne. Tofu is extremely versatile–can do desserts, beverages, appetizer dips, sauces, salad dressings, smoothies, ground meat or egg subs, and then some! It’s like a sponge or blank canvas–waiting for you to give it flavor. If you haven’t read it, I think you’ll get a kick out of it. 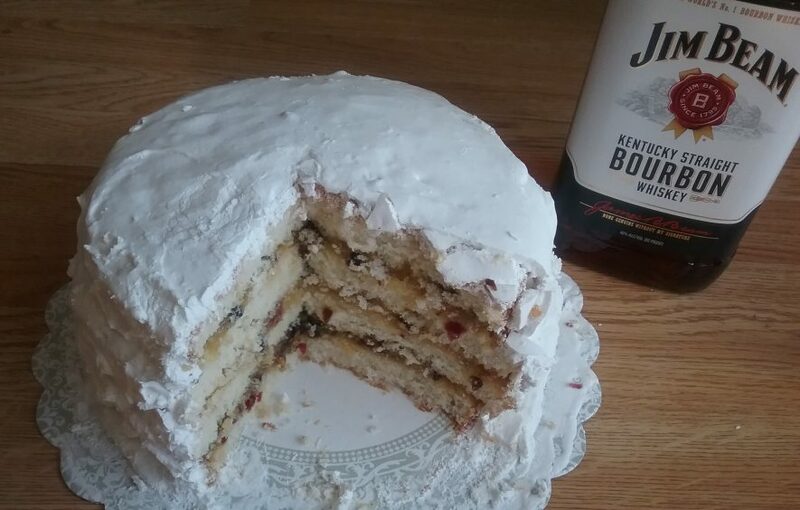 Love it–thanks for sharing, Fannie. I haven’t read, but happy for the link. Crazy stories. Liz, I don’t know how you do it. This is like the 346th food that I thought I’d hated but you’ve made me YEARN FOR IT IMMEDIATELY. wow, 364. I’m here to change your life, Becky. Glad if I can make you yearn for foods you didn’t think you were fond of. All about having an open mind 😉 Though I’m sorry that your fellow commuters don’t have an open mind and manners enough to let you finish that peanut bar. Sheesh. This looks deLizious!! I’m giving pescatarianism a try to see if it works for me. I need to try this recipe! Aw shucks, thanks Kaela 🙂 Would love reports on the pesca diet. Would recommend this lasagna even for meat eaters. You would never know it was tofu, especially as there’s so much cheese going on 🙂 Appreciate your visits very much. Oooh looks so good. I really like tofu despite what they say about it! There’s health benefits in it too! Foods generally aren’t perfect. I think I will make this recipe for my husband who thinks tofu is bland. Thanks, Sam 🙂 Tofu IS bland, really, but that’s part of it’s charm–you can mix it with just about anything and it takes on the other flavors. It’s especially good with sweet stuff (chocolate, pumpkin, lemon, etc) so hope you clicked over to Shanna’s mousse. Totally agree that foods aren’t perfect, which is why variety is good.